During Francisco D’Souza’s tenure as CEO starting in January 2007, Cognizant has expanded revenue from $1.4 billion to $7.35 billion—a compounded annual growth rate of more than 30%. Bangalore: On an early November day in 2011, a man with a boyish face and pensive expression paid a visit to the office of J. Bruce Harreld, a lecturer on entrepreneurial management and strategy at Harvard Business School and a former head of strategy at International Business Machines Corp. (IBM). The visitor was Francisco ‘Frank’ D’Souza, chief executive officer (CEO) of Cognizant Technology Solutions Corp.—a company that had already out-paced India’s biggest software services firms in revenue growth and was set to disrupt the pecking order in the country’s then $60 billion information technology sector. 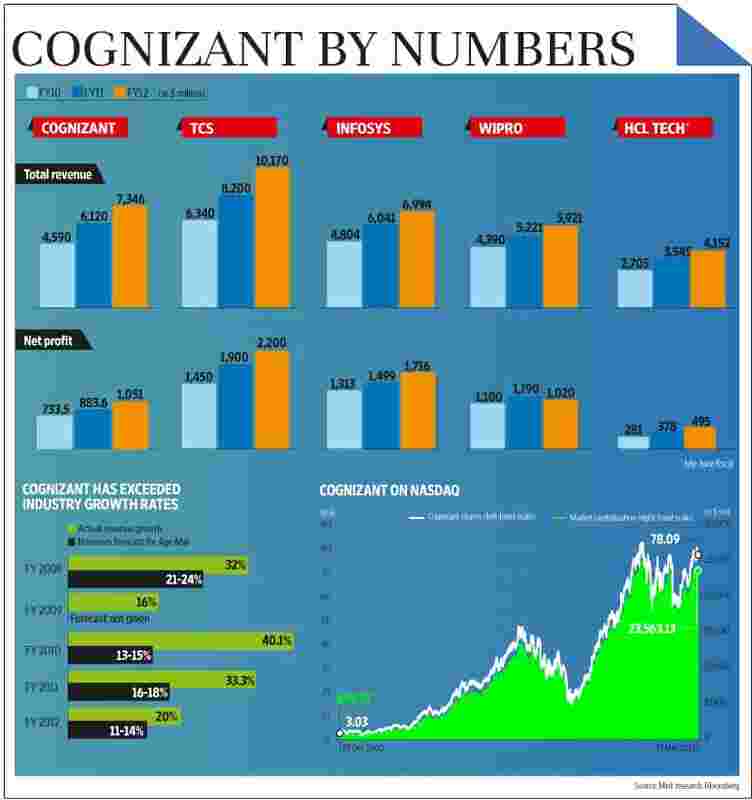 Even after the collapse of Lehman Brothers in 2008 and the global financial crisis it triggered, Cognizant had managed to sustain its double-digit pace of revenue growth. That was at a time when top outsourcing customers had scaled down spending and rivals such as Infosys Ltd—India’s second biggest software services exporter—had reported its first fall in income ever. Nevertheless, Harreld recalls, that day in 2011, D’Souza still appeared a little paranoid about the future of Cognizant, a Nasdaq-listed company that traces its origins to Chennai and has most of its workers in India. The purpose of his visit to the veteran strategist was to learn some lessons from IBM’s “near-death experiences" in the early 1990s, after which Big Blue (a nickname IBM acquired from selling blue-painted mainframe computers) created 20 new businesses in a new group called the Emerging Business Organisation Opportunities that would generate upwards of $15 billion in fresh revenue between 2000 and 2005. D’Souza’s aim was to imitate IBM’s strategy by creating a $7 billion start-up that was able to compete with newer, potentially disruptive rivals. “As I recall, Frank described Cognizant’s core business as doing quite well," said Harreld, who retired from IBM in 2008, remembering the two-hour discussion. “However, they were having difficulty building future businesses. It became quite clear to me that Frank was very worried about this problem, and he was genuinely searching for answers. It was an intense conversation, not idle chit-chat." Harreld was a good choice for an adviser; in many ways, D’Souza was facing the same problem that had preoccupied IBM CEO Louis Gerstner in September 1999. A study at the company found that it had failed to capture value from 29 separate technologies developed internally over the years. While IBM had developed the computer router, for example, Cisco Systems Inc. had become the market leader in routers. “This is a classic issue faced by many CEOs," said Harreld. “Many organizations become acutely skilled at exploiting their existing businesses while ignoring the exploration of future ones. It’s a formula for disaster as the existing businesses ultimately mature, growth slows and the enterprise stagnates." D’Souza then put together a plan to create a Silicon Valley-like organization that would experiment with new ideas, incubate businesses, fail and learn fast inside Cognizant. In seeking a solution for such a problem back in 2011, D’Souza was, characteristically, ahead of his peers. India’s top software firms including Infosys and Wipro Ltd, both based in Bangalore, are only now grappling to deal with the same issue. During D’Souza’s tenure as CEO starting in January 2007, Cognizant has expanded revenue from $1.4 billion to $7.35 billion—a compounded annual growth rate of more than 30%, compared with 19.7% for Tata Consultancy Services Ltd (TCS), 17% for Infosys and 18% for Wipro during the same period. In the same time, the company’s employee base has grown from 55,000 to over 155,700. It has been named a member of Standard and Poor’s 500, Fortune 500, FT 500, Forbes Global 2000, and one of Forbes magazine’s Fastest Growing Tech Companies. Last week, a survey by online jobs and companies website Glassdoor rated D’Souza the sixth most approved-of CEO in the technology industry, as per employee feedback, ahead of Apple Inc.’s Tim Cook and Google Inc.’s Larry Page. Last month, the directors of General Electric Co. (GE) picked D’Souza to join the board to provide insight on shaping a digital future for traditional products—a coup for any CEO, let alone a 44-year-old who has headed his company for just five years. In an email statement on the pick, GE chairman and CEO Jeff Immelt wrote: “Frank D’Souza brings great perspective as a leader and a pioneer in services and software." Harreld had another view: “My guess is they (GE) see what I saw that day in my office—a very talented, disciplined, charismatic leader with global experience and an inquisitive mind." He had planned to travel to India in February this year to attend the Nasscom leadership summit, an annual event organized by the industry lobby in Mumbai, but cancelled the trip after he tore a ligament in his left knee playing soccer with his eight-year-old son and his friends. “When I am trying to make it sound glamorous, I say I was playing soccer. The real story is that I was playing with a bunch of eight-year-old kids," he says. D’Souza can afford to laugh at himself occasionally. After all, he is already looked upon by several first-generation entrepreneurs of the Indian information technology (IT) industry as an ideal CEO—young and bold enough to take new risks ahead of rivals. In fact, N. Lakshmi Narayanan, vice-chairman of Cognizant who mentored D’Souza during his early days and passed him the CEO position in 2007, said the best decision he ever took was to get out of his protégé’s way early. “If you find somebody standing in (line at) midnight waiting to buy iPhone 5, we say that’s the Cognizant type of a guy. Before he took over, we were clear we wanted a person with his kind of energy and global mindset," Narayanan said of D’Souza. This global mindset is clearly a product of D’Souza’s unusually international upbringing. Born in Nairobi, the son of an Indian Foreign Service officer, D’Souza studied in seven schools around the world—in Panama, Zaire, New Delhi, New York, Trinidad, Hong Kong and Pittsburgh. “We grew up in a household that was very nationalist, closely associated with India, even though we spent most of our lives outside," he says. “Early in my life, we spent a lot of time in Africa where my father served in places like Kenya, Ethiopia and Zaire. My father took his role as India’s representative very seriously and was very passionate about promoting India in different parts of the world." D’Souza credits his parents for taking him and his three sisters around the world with them as they travelled, enrolling them in local rather than international schools in each place, so they’d have to learn the local languages and assimilate different cultures. He remembers particularly arriving in Panama aged five and being put in a Spanish-language school. “It was sink or swim," he says. “In a new country, at a young age, without knowing a word of the language, it was a difficult situation. But my siblings and I adapted, and by the time we left Panama six years later, we were fluent in Spanish, conversing in the language with each other at home. We learned to survive and thrive in a ‘flat world’ long before the flat world came in vogue!" D’Souza later took his Bachelors degree in business administration from the University of East Asia, Hong Kong, (now the University of Macau) and his Masters in the same subject from Carnegie Mellon University in Pittsburgh, on the board of which he now serves. He also has board positions at the New York Hall of Science, and the board of trustees of the US-India Business Council. He plunged into business at an early age. Straight after school, D’Souza moved to Hong Kong. “I needed work and educational grounding before I applied to the American B-schools," he says. “So I taught myself programming, accepted contract work and later joined Indian Overseas Bank’s Hong Kong branch in the clerical grade." Starting work at 18, he studied at the same time and gained considerable technical skills and experience. The MBA from Carnegie Mellon gave D’Souza enough recognition to be campus-recruited by Dun and Bradstreet Inc. (D&B), an information services firm. It was not an idle choice for D’Souza; he says he wanted to be a part of a company where technology was a business, not a support system. At D&B, D’Souza spent two years at various locations, including the US and Germany, before hearing that the company was moving into emerging economies—India, China and Russia. He came to India in 1993 to set up D&B’s technology arm from scratch—the groundwork for what would eventually become Cognizant. D’Souza remembers the point at which he started worrying about Cognizant’s future—about 18 months ago—as well as Harreld does. “The company was doing well, growth rates were healthy, the core business was doing well," he says. “Each of our core businesses (that we now call Horizon 1) had become very large and successful in their own rights. Rightfully so, the business unit leaders were focused on immediate priorities of maximizing market opportunities and growth." “The issue that I was trying to solve is the typical innovator’s dilemma," he says. “Sometimes you can lose focus on the next generation of services, keeping your eyes on the future. We thought a lot about this and said we’re not the first company to have ever experienced this problem." The idea was for Cognizant to “use a venture capital paradigm" to grow new business, “with a venture leader running each of them like a CEO", D’Souza says, mixing old talent with new. “One of the pieces of advice I got was to get some of the most seasoned leaders in the company to move to the Horizon 3 business, so that they could apply their wisdom of years. But they had to be paired with fresh talent that could bring new thinking for the true power of this strategy to work. And that’s what we have done," D’Souza says. “If you look at our venture partners, it’s a mix of Cognizant veterans having run big businesses at the company, plus new people we hired from the outside." The combination of senior and junior talent in expanding new business was extremely important, according to Harreld. In a paper for the Harvard Business Review, Harreld had described the problem with most new initiatives launched by big business: they tend to be handed to inexperienced junior executives because “if the youngsters screw up, it won’t have a significant impact on the corporation’s performance". “It is a recipe for failure," the article continued, “which explains why most new businesses launched by established companies fail, and why only a tiny fraction of firms around today—including major corporations—won’t be here in 25 years." It was this problem that Harreld shared with D’Souza that day in 2011. “Frank was incredibly inquisitive about the three-horizon model, why companies fall into this trap, and how leading enterprises break out of it," he said. But there was another, more significant driver of the success, D’Souza says. “One of the things we dealt in 2012 was we had to take our guidance down. As you can imagine, that created tremendous focus in the company on making sure that we met our short-term goals. To me, that’s the single testament of how the model worked, because it allowed us to protect our long-term focus even when there was extreme short-term pressure in the business. If we had not had this construct of the Emerging Business Accelerator (EBA), I think it would have been very easy for us to just focus on the short-term goal of meeting revised revenue guidance." The various aspects of the company remained mutually dependent, says D’Souza, with “the core business funding a portion of the cost of getting these businesses started so they (the existing leaders of Cognizant) have seats on the board, they are financial investors, and they also know that these businesses will graduate and become part of their organizations". For D’Souza, growing Horizon 3 has been challenging as well as liberating. He has taken a personal and very hands-on approach in its creation, he says. “We made this decision like we make a lot of decisions at Cognizant," he says. “I sat down with my senior leadership team and discussed the big transitions going on in the industry. We knew that we had to be ambidextrous and focus on all the three horizons with equal rigour. I said, ‘It makes sense for Raj (Rajeev Mehta, group CEO of industries and markets), Chandra (R. Chandrasekaran, group CEO of technology and operations) and Gordon Coburn (president of Cognizant) to run the Horizon 1 and 2 businesses, and I will spend time with Horizon 3 stuff. From our backgrounds and interests, it seemed like a logical thing to do." Horizon 2 consists of consulting, business process outsourcing and computer infrastructure services—the areas where Cognizant started investing five years ago. Today, they contribute some 20% to the overall revenue. Nurturing the emerging business sector has been fun, D’Souza adds. “It’s something that I have thoroughly enjoyed doing. Everyday I wake up thinking about new ideas. But at the same time we have to realize that Horizon 1 and 2 account for the lion’s share of our business and I can’t take my eyes off them," he says. The driving force behind many of these innovations is D’Souza’s uncompromising work ethic. “We have certain growth ambitions at Cognizant; we want to grow faster than the market," he says. It’s been nearly 20 years since he came to India first with D&B. “Those days we were up all night," he says, and things haven’t changed much since then. “In today’s era of volatility, there is no other way but to re-invent. The only sustainable advantage you can have over others is agility, that’s it. Because nothing else is sustainable, everything else you create, somebody else will replicate." Cognizant’s success in an established market can be explained by a number of factors, according to experts, but many of them relate to D’Souza himself. Vinnie Mirchandani, a former Gartner Inc. analyst, who now runs technology services blog Deal Architect and has watched Cognizant’s progress over the years, said D’Souza was careful to avoid treading on the toes of his rivals in the early days. “During 1993-98, none of the Indian biggies considered Cognizant any threat. He kept it like that and didn’t threaten them too much," Mirchandani said. Executives at rival firms track Cognizant’s every move closely, especially after it overtook Infosys and Wipro in revenue (both quarterly and annual). And, while most of them privately acknowledge that Cognizant has surprised them over the years, some say the real test for D’Souza may still lie ahead. “Frank has been quite fortunate to have a senior founding team that still stays intact," said the CEO of a mid-size software firm that competes with Cognizant, who wanted to remain anonymous. “But he has built on what he inherited from Kumar Mahadeva (founder chairman of Cognizant) and even Lakshmi (Narayanan), he did not have to turn around Cognizant from a very bad situation or such. Despite all good things, Cognizant is yet to face a real crisis, and that will be the real test for Frank and his team." Founders typically don’t mature into good operational managers, Mirchandani said, but he feels D’Souza has managed the transitions well. “Sometimes I find some India-based CEOs to be surrounded by too many ‘yes men’, so in that sense, it has helped Frank that he is not based in India," he said. “In fact, I thought a few years ago that somebody would poach Frank away to another industry, he’s that good." According to Phil Fersht, founder of outsourcing advisory firm HfS Research, Cognizant’s strength lies in having a US-based leadership team, something that its rivals have not been able to replicate. “Until Infosys, TCS and others realize that they need to globalize their leadership more effectively, the gap will not start to close the other way," Fersht said. It was a lesson D’Souza learnt early on. “D&B was a $5 billion revenue conglomerate of 10 operating companies," he says. “And it was spending around $800 million every year on IT. There was no mandate that D&B would use our services exclusively. Thus, we learnt to compete." “D&B was clear about bagging large-scale projects in India and not just body-shopping, so the DNA for a full-scale business service provider was created right at the inception. Soon we realized that we needed more challenges. So I went back to the US in 1998 to build a client services platform," D’Souza says. At that time, “half of our revenue came from D&B", he says, “and it was a matter of time before we learnt that bagging new businesses in new verticals and domains would be the only drivers for growth". In 1995, D&B spun off its subsidiaries and Cognizant was born. It was still early days for D’Souza. “As director of US operations, I had an amorphous role—one day I would be selling our services, the next I had to deal with how to get people paid," he says. D’Souza’s career progressed from director (US operations) to vice-president for North American operations, and then senior vice-president, chief operating officer, and now CEO. “If there is one thing in my personal life that has made a decisive impact on business in Cognizant, it is the multicultural experience that I have gained and cherished," he says. “From the beginning, we have consciously built the organization with this ‘multicultural’ flavour because to serve the global marketplace, you need to be glocal. What I learnt growing up in a microcosm, is very much alive in the DNA at Cognizant." While Cognizant was born global, D’Souza says, the key to its success was its agility. “Far more than a global mindset, what I learnt was how to change quickly and adapt rapidly. I think this, perhaps more than anything else, is a key to success in the business world today." Old colleagues such as 52-year-old Srini Raju, who worked with D’Souza during the early days of Cognizant and now invests in start-ups, said he was always very ambitious. “Frank was spotted by D&B in Carnegie and was given to us as part of the management trainee programme," Raju said. “He was very mature for that age, I can remember." He added, “A very hard-working and focused guy, not a superficial one. Moreover, he was single then, so there were no distractions." D’Souza now lives with his wife, a son and a daughter in New Jersey. Whether they are distractions from his work ethic or not, D’Souza maintains that he is not just focused on business. “This may sound a little naïve," he says, “but you know I am driven by just a few things—I wake up in the morning and say, ‘Am I having fun? Am I solving client problems and is my team enjoying what they are doing?’"
Cognizant is now attempting to replicate the way a Silicon Valley start-up operates in finding new ideas and funding them. Since last year when EBA was set up, Cognizant has funded over a dozen new ideas with seed funding of anywhere between $50,000 to several million dollars depending on the business potential. “Cognizant expects each of these ideas to become to earn $100 million in fresh revenue in the next few years," says D’Souza. “We have already started seeding for the next five years," D’Souza says. “This fifth generation of technology is more profound than anything in history—just the way I was in awe some 10 years ago with the Internet." Mahesh Venkateswaran, a senior vice-president and EBA at Cognizant, said the team looks for three things in new avenues for growth: potential for growth, differentiation and platforms for non-linear revenue. Unlike the traditional software outsourcing business, where predictable revenue streams determine whether a new opportunity should be pursued, these corporate incubators even encourage experiments to fail, but fast enough to avoid prolonged and fruitless investments. “One thing we made loud and clear is that failure was an option; not all we try would succeed and there could be many that may fail. We don’t want to penalize individuals for taking risks," said Venkateswaran in a December 2012 interview with Mint. Some 30% of these ideas failed and were spotted early enough by D’Souza and his team. “One of the ideas that has worked is called AssetServe. It manages all digital assets, namely videos, pictures and rich media for customers," D’Souza says. A “very large automotive client is going to deploy this solution for 10,000-14,000 users," says D’Souza. “We are in the process of going live. If I wind up with a 50-60% success rate in the first year, that would be pretty good." According to Chandra Gnanasambandam, a partner at consulting firm McKinsey and Co. who relocated from Silicon Valley to Bangalore recently, Cognizant’s outlook is one that may be forced upon its competitors very soon. Outsourcing customers are pushing firms such as Cognizant to explore the Silicon Valley model, he said. “A banking customer that has huge data is asking, ‘Why I can’t do what Google is doing with data?’" Gnanasambandam said. “The first question they are asking is, ‘What are these guys in Silicon Valley doing that I can also do to change the game.’"
According to Mirchandani of Deal Architect, D’Souza knows that all too well. “You have to keep running better, but that’s not enough," he says. “You also have to run different,"
Anirban Sen contributed to this story.